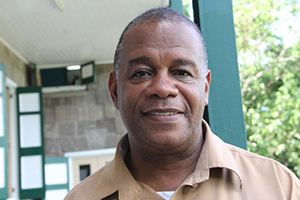 NIA CHARLESTOWN NEVIS (October 16, 2014) — Permanent Secretary in the Ministry of Agriculture Eric Evelyn urged the public to help make the Department of Agriculture’s mini fair at the Public Market in Charlestown on October 17 a success. “We are hoping through the theme this year, we can sensitise persons to the importance of family farming. Of course when we were growing up farmers and their entire family were involved and we have seen a gradual movement away from that. A lot of the family members are not involved in farming and we want to show the persons involved in farming that it is important to get the entire family involved – husband, wife, children,” he said. A number of farmers throughout the island are also expected to have their produce on sale at the fair along with products from the government-owned abattoir and agro-processors on Nevis. According to Evelyn, World Food Day is geared towards supporting the FAO’s fight against world hunger and the activities hosted by the Department in observance of that day are also about ending world hunger. “We are asking you to support the activity, bearing in mind that the whole World Food Day activity is geared towards ending hunger worldwide. Of course we are not suffering from hunger here in Nevis, per se, but we are joining in the observance and we are hoping, through the activity, that we join the rest of the world in ending hunger and having more food security here on the island and so we are asking persons to join us as we celebrate World Food Day 2014,” he said. Other activities which marked the Ministry and Department of Agriculture’s observance of World Food Day, was an address delivered by Minister of Agriculture Hon. Alexis Jeffers, members of the Department’s participation in Voice of Nevis (VON) Radio’s Morning Inspiration programme and the Department of Agriculture’s participation in an Awareness and Education Fair titled “Careers in Statistics” which was hosted by the Department of Statistics and Economic Planning in Charlestown on October 15, 2014.